The Canterbury Music Hall, Bristol was built in 1855. The Music Hall hadn't been open long though when it was destroyed by fire on the 24th of September 1859, and so important an event was it that the ERA rushed to report it in the same day's edition saying:- 'At about a quarter before two o'clock this (Saturday) morning great alarm was created throughout the city by the breaking out of a fire at the Canterbury Music Hall, situated in Maryport-street. The conflagration was first discovered by the policeman on the beat, who lost no time in giving the alarm, but owing to the large quantity of woodwork in the building and its wooden stage, scenery, and adornments, the fire spread with fearful rapidity, and the large area was speedily filled by one dense mass of flame which soon broke through the roof, and placed the adjacent premises in the most imminent peril. 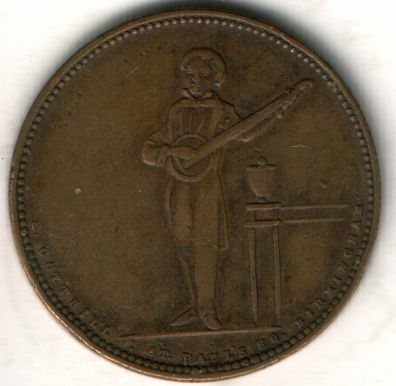 Right - A Music Hall Token for the Canterbury Music Hall Bristol. One side reads: Canterbury Music Hall Bristol - 3D - Refreshment Ticket - For This Evening Only. The other side reads: E. COTTRILL St Pauls 80 Birmingham. - Very kindly sent in by Tony Sandy. The police alarm was rapidly disseminated, and in a very short time the various fire-engines arrived in the following order: - The West of England, Police, Norwich Union, and Sun; and there being a plentiful supply of water from the Bristol Water Works Company's mains, they at once commenced playing on the flames. It soon became evident to the directors of the fire engines and police authorities that all attempts to save the Canterbury Music Hall must prove abortive, and their efforts were forthwith directed to the preservation of the adjoining properties. Left - A Music Hall Token for the Canterbury Music Hall Bristol. 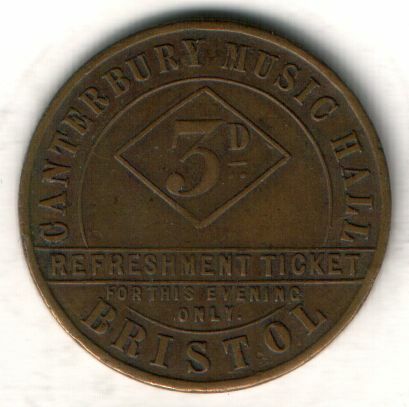 One side reads: Canterbury Music Hall Bristol - 3D - Refreshment Ticket - For This Evening Only. The other side reads: E. COTTRILL St Pauls 80 Birmingham. - Very kindly sent in by Tony Sandy. The extensive tobacco and snuff warehouses of the Messrs. W. D. and H. 0. Wills and Company caught at the back, as did also those of Messrs. Roughsedge and Summers, sodawater manufacturers; and those of Mr. Shuttlewood, hosier and haberdasher, Messrs. Laverton and Company, furniture manufacturers, and some of the houses which lie on the Eastern side of St. Maryleport Churchyard were placed in such peril that their preservation was at one time despaired of. The Messrs. Wills's property was placed in such extreme jeopardy that the partners, who were early on the spot, together with some of the hands and many neighbours and friends, exerted themselves energetically for the preservation of the books and the more portable and valuable portions of the stock. Fortunately, however, the efforts of the police and firemen were crowned with success, and at about a quarter before three o'clock the roof of the Canterbury-hall fell in with a crash, and, carrying with it the burning rafters and fittings, greatly diminished the violence of the conflagration. The well-directed efforts used soon extinguished the fire in the adjacent premises, and at the time at which we write (half-past three o'clock) it is hoped that the catastrophe has been confined to the entire destruction of the Canterbury-hall, and the damage we have named to the properties adjoining. Mr. Superintendent Handcock and a strong body of police were on the ground, and kept the streets so clear that there was no impediment in the way of the firemens' operations. It was a most fortunate thing that there was a strong westerly wind blowing; had the current been setting in an opposite direction, there can be little doubt (as the buildings leading to the bottom of the street are very old) that Maryport-street would have been destroyed to High street on the southern, if not indeed on the northern side. No estimate of the extent of the loss can be at present formed, nor could we find, amidst the excitement and confusion which prevailed, what insurance offices will be affected by the disaster. Owing to the extent and brilliance of the flames, the fire could be seen from most parts of the city and surrounding heights, and large numbers of citizens were attracted to the spot. Above text in quotes is from the ERA of the 24th of September 1859. After the fire the Music Hall was subsequently rebuilt but by 1863 it had been converted into a 'Dining Room'.